Washington Post photos There's plenty of ways to prepare biscuits, but the ideal way to consume them is right out of the oven. For flaky biscuits, use your fingers to flatten the butter into “leaves” that are still visible in the dough. 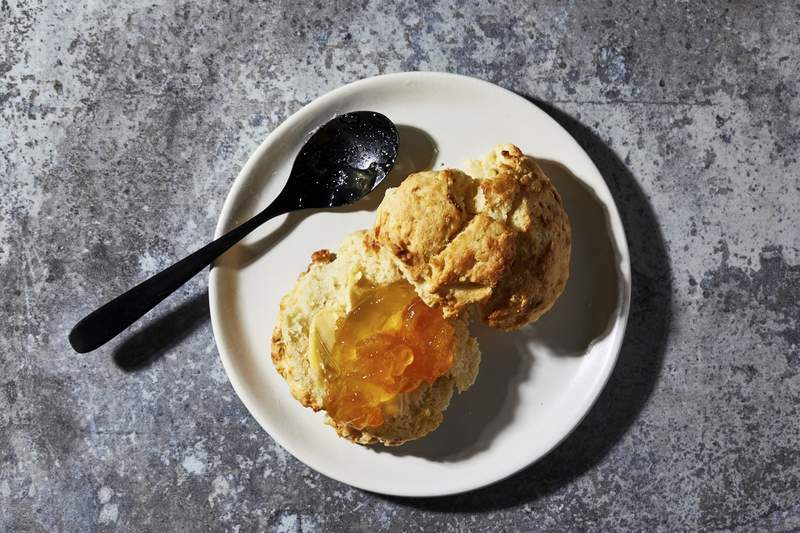 Washington Post photos Enjoy your Drop Cream Biscuits with a spoonful of marmalade. Biscuits are versatile and can accompany several types of foods. If you like biscuits with layers that practically pull apart themselves, chill the dough in between folds. MUST CREDIT: Photo for The Washington Post by Stacy Zarin Goldberg; food styling by Bonnie S. Benwick/The Washington Post. Flaky Butter Biscuits. MUST CREDIT: Photo for The Washington Post by Tom McCorkle; food styling by Bonnie S. Benwick/The Washington Post. Twisting a cutter will yield squat biscuits with poorly defined layers, such as the one on the right. MUST CREDIT: Photo for The Washington Post by Stacy Zarin Goldberg; food styling by Bonnie S. Benwick/The Washington Post. If there were a personality test for biscuits, it would look something like this: a map of the United States filled with pins, dusted with flour and streaked with butter, with a big honking question mark superimposed over the whole thing. Because there is no one perfect biscuit: There's just the biscuit that's perfect for you. Unlike, say, a macaron or even a bagel, biscuits lend themselves particularly well to tweaks to suit your taste. Sure, there's chemistry and intertwining causes and effects at work, and we'll get to all that, but a little well-thought-out experimentation is welcome. “When you go to make biscuits, I think you need to know what you want,” says Martin Philip, head baker at King Arthur Flour. His history is so intertwined with the baked good that the first recipe in his cookbook, “Breaking Bread: A Baker's Journey Home in 75 Recipes,” is for biscuits. So what do you want? The biscuit matrix covers fluffy and tender to flaky and sturdy enough for a sandwich. You might want them tall, maybe a little tangy or decadently buttery. You could go the drop-biscuit route, bust out the rolling pin or practice your folding skills. Here's everything you need to consider. Cookbook author and Southern food ambassador Nathalie Dupree swears by White Lily Flour so much that she brought her own bag to our food lab. Cooks like Dupree treasure self-rising White Lily (it has salt and leavening in it already) for its fine-milled texture and low-protein content (8 to 10%), which lead to especially tender biscuits. Flour with lower protein forms less gluten when it comes into contact with liquid in the form of the water in butter, or your dairy of choice. More protein means more gluten, which means a chewier texture. Ayeshah Abuelhiga advocates a middle-of-the-road approach with all-purpose flour (10 to 12% protein). 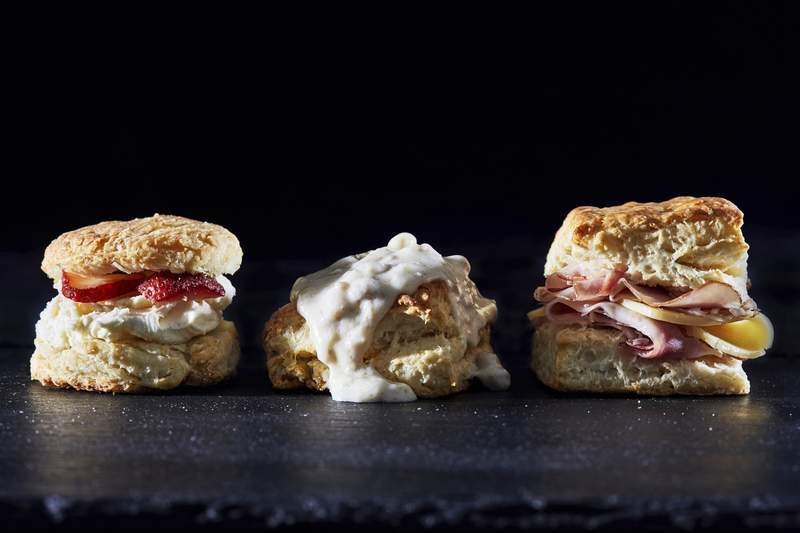 The founder and CEO of Washington's Mason Dixie Biscuit says her team started testing recipes with pastry and cake flour, which have even less protein than White Lily, but the crew found the results too inconsistent and cakey, and too weak for a sandwich. Bread flour's high protein content makes it a no-go for biscuits. This is where the other part of the gluten equation comes into play; just like flour, liquid will help determine tenderness. Rise. Buttermilk's tangy flavor and thick texture are enough to recommend it, but its acidity also gives the baking soda and/or powder something to react with, Philip says. A more vigorous reaction means a higher rise. (Remember those vinegar-and-baking-soda volcanoes in school?) If you're using milk, lemon juice can help create a similar reaction. Richness. While developing a scone recipe, Philip says he had a “light bulb” moment. Using buttermilk gave him the flavor he wanted but not the texture. He swapped the buttermilk for half-and-half, and the additional fat resulted in an especially tender scone. You'll get similar results in a biscuit, especially if you step up to cream. The right mix. For tender results, use a wide bowl and stir the liquid in until it's just incorporated. You may need to dial back the liquid if you're in a warm, humid environment or add a bit when it's cool or dry. In making Philip's recipe (below) in our food lab, I consistently found the dough too crumbly to handle. I adjusted the amount of buttermilk. Too much and the dough was sticky and gluey, but just a tablespoon more allowed me to get the dough from the bowl to the counter as a shaggy yet relatively dry mass instead of as a pile of crumbs. Dry bits will be incorporated as you shape the dough. A buttery biscuit owes its melt-in-your mouth texture to fat, which tenderizes the dough by interfering with the formation of gluten. Philip also prefers the flavor and texture that butter imparts. Shortening has no water, which is key for producing the steam that helps lift the biscuits. Butter, by contrast, has almost 20% water. Shortening “also really has no flavor,” he says. Lard, like shortening, is 100% fat. Erika Council, a food writer who runs the Bomb Biscuits pop-up in Atlanta, says her best biscuits are made with lard, “hands down.” They're especially tender in the middle while still managing to hold together. The key, however, is finding good lard, which Council can do because she sources hers from her best friend's barbecue spot. If you're struggling to get a tender biscuit, the answer is almost always more fat and less moisture. And don't forget that fat can come from your liquid: The cream biscuit recipe below, from Cook's Illustrated, is one example of how well it can work on its own. As with all baking, management of temperature is key, right from the beginning. Cool ingredients. If the butter starts to melt as you're mixing the dough, water moves into the flour, forming gluten. The goal is to keep the butter as cold as possible before the dough goes into the oven, so try refrigerating your dry ingredients and butter. When the butter melts in the oven, it gives off steam that creates flake and lift. Chill the dough. 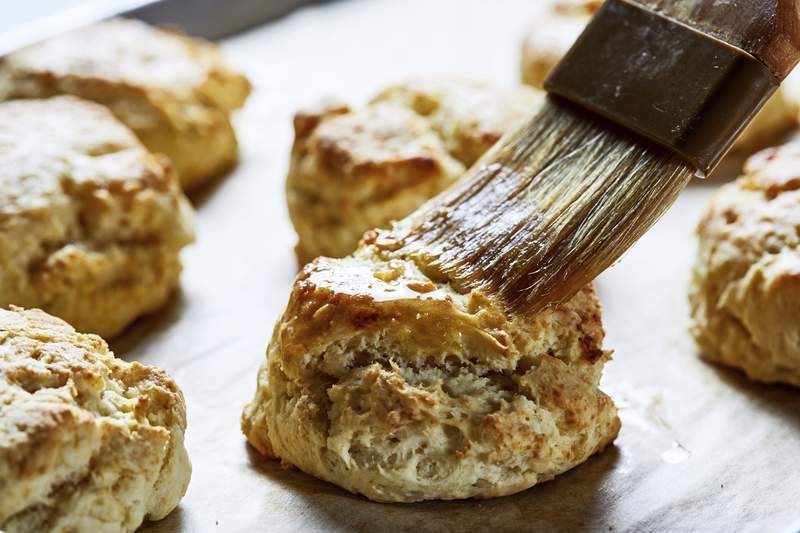 Chef Marjorie Meek-Bradley of Washington tavern St. Anselm has earned a cult following for her tall, flaky biscuits. She refrigerates her dough – which is made with frozen, grated butter – several times, between the folds she executes for guaranteed layers (more on that below). I tried it with 20- to 30-minute rests in the fridge, which gave me dramatic layers. Hot oven. With a relatively short bake time, a hot oven gives you an initial blast that activates the leavener (double-acting baking powder starts working when exposed to liquid and heat) and quickly melts the butter to create steam. For Philip, a hot oven is 425 degrees. For the Cook's Illustrated cream biscuit recipe, it's 450. For Douglas' uberbuttery version, it's 475. Even out the heat. Avoid scorching the bottoms of the biscuits by baking on a lined sheet in the upper third of the oven. Knowing whether your oven has hot or cool spots is helpful, but you can make up for them by rotating the sheet from front to back during baking. And use the convection feature if you have one. The fan circulates hot air, helping you achieve an even bake. Know when the biscuits are done. Look at the color. Philip wants to see a golden top, and signs of browning on the bottom and sides of the biscuits. Browning means better flavor. “You need to have the kiss of the oven,” he says. How you form and arrange your biscuits has as much impact as what you put in them. Flaky or fluffy? If your goal is flaky, then folding your dough, as you would in puff pastry, is the way to go. Council starts by cutting her dough square into thirds so she can stack it and create immediate layers before she proceeds with a few rounds of folds. 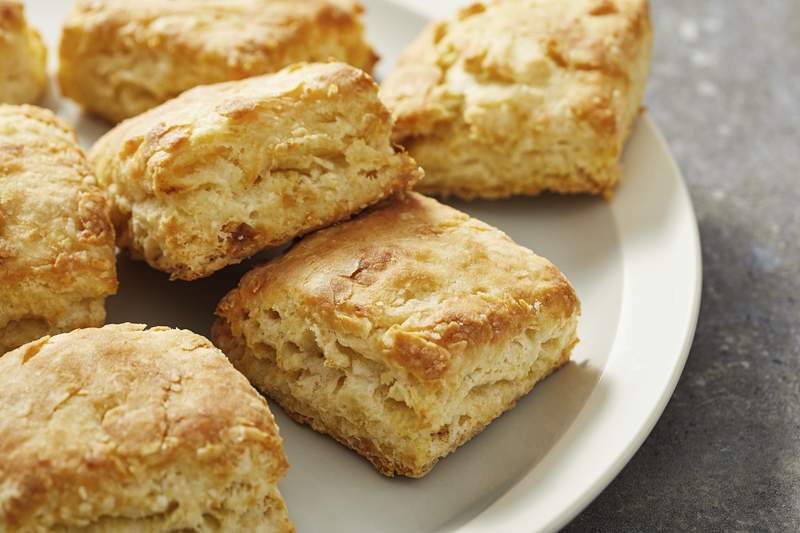 If you prefer a fluffy, craggy biscuit that you can tear apart and treat more like a dinner roll, try a drop biscuit. Clean cuts. The sharp edges of your chef's knife, bench scraper or biscuit cutter and a straight-down (no twisting!) cutting motion contribute to tall biscuits. Rotating my cutter caused the layers to lose their definition, leading to a squatter biscuit. Follow a recipe first. “Make sure that what you're doing is a solid representation of a solid recipe,” Philip says, and then design your perfect biscuit. People who have been making biscuits for decades, like Dupree, have the knowledge and muscle memory to literally pour out flour and cream without measuring exact amounts and end up with a beautiful result. The rest of us at least need to start with known quantities (preferably measured by weight) and some guidance. No matter how you get there, everyone agrees: Biscuits are best eaten warm out of the oven. Now is the time for you to seize that moment. Depending on the temperature and humidity of your kitchen, you may need to use more or less buttermilk. 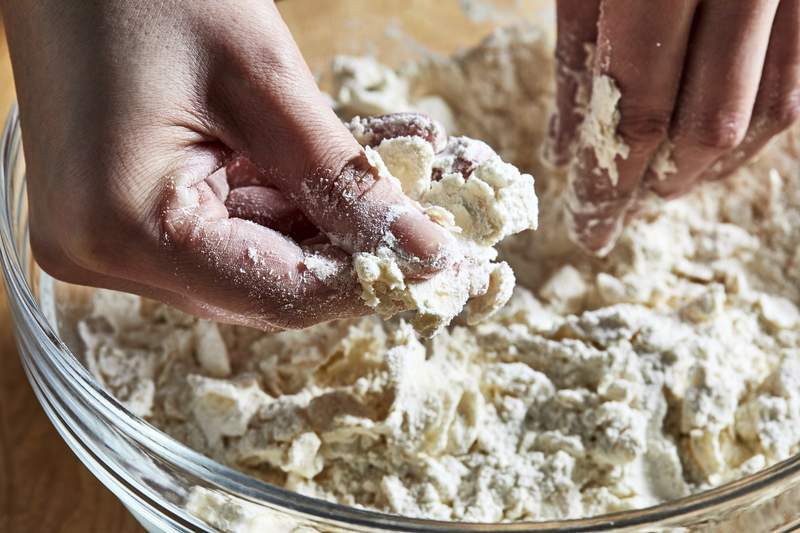 You don't want the dough to be crumbly, but it should start to hold together in the bowl without being gluey. If you wish to make round biscuits, you'll need a 2-inch round cutter. To cut rectangular biscuits, a metal bench scraper works well. Cut the cold butter into 1/8-inch-thick slices; refrigerate until you're ready to make the dough. Whisk together the flour, salt, baking powder and baking soda in a mixing bowl, and refrigerate that as well. Position a rack in the upper third of the oven; preheat to 425 degrees. Lightly grease a rimmed baking sheet, or line it with parchment paper or a silicone liner. Add the cold butter pieces to the chilled dry ingredients, tossing them until they are evenly coated. Press the butter pieces between your thumbs and forefingers into small flat pieces, or “leaves.” (Some pieces as big as a quarter are OK.) Add the buttermilk, as needed, and mix gently until just combined. The dough should be barely cohesive; don't worry if there are dry bits, because they will be incorporated as you pat and fold the dough. Lightly flour your work surface. Transfer the dough there, patting it into a 3/4-inch-thick rectangle. Fold the dough in thirds as you would a letter, bringing one-third in over the middle third, followed by the final third over the other two. Gently roll or pat the dough into another rectangle. Repeat this fold-and-roll process once more if the dough isn't cohesive or if you want to create more layers. Lightly flour the top of the dough. 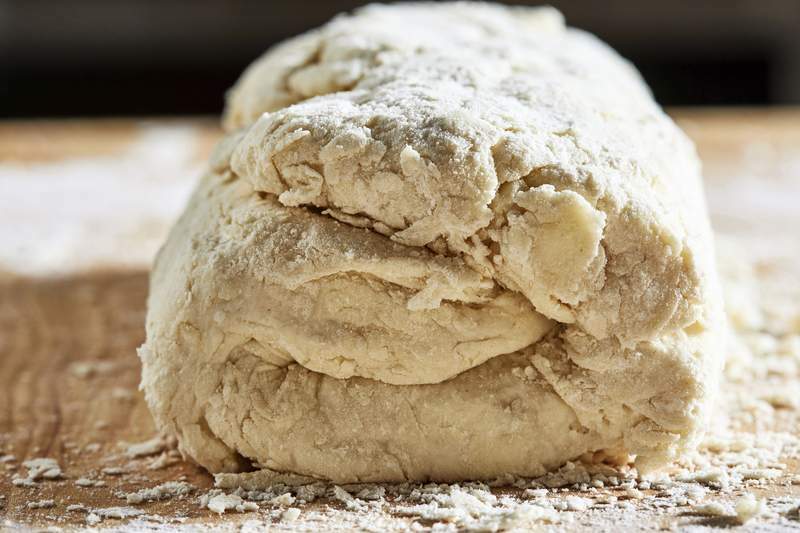 Use the 2-inch cutter to create 10 to 12 rounds of dough, being careful to cut straight down and not twist the cutter (to ensure the biscuits get the best rise). You can re-roll the dough once, though you might not get the same rise. Or use the bench scraper or a sharp chef's knife to square the sides and edges of the dough rectangle, then cut eight to 10 squares or rectangles. Place the biscuits on the baking sheet, spacing them about 2 inches apart. Bake (upper rack) 16 to 18 minutes, rotating the pan from front to back after 14 minutes, until the biscuits are golden. If you wish to brush the biscuit tops with melted butter, do so as soon as they come out of the oven. Serve warm, or at room temperature. Makes 8 to 12 servings. Position a rack in the upper third of the oven; preheat to 450 degrees. Line a rimmed baking sheet with parchment paper or a silicone liner. Whisk together the flour, sugar, baking powder, baking soda and salt in a mixing bowl. Microwave the cream in a microwave-safe container on high 60 to 90 seconds, until just warmed to body temperature (95 to 100 degrees), stirring halfway through. Stir the warm cream into the flour mixture to form a soft, uniform dough. Grease a 1/3-cup dry measuring cup with cooking oil spray. Use it to drop 10 or 11 level scoops of batter 2 inches apart on the baking sheet; the biscuit portions should measure about 21/2 inches wide and 11/4 inches high. Re-grease the measuring cup after every three or four scoops. 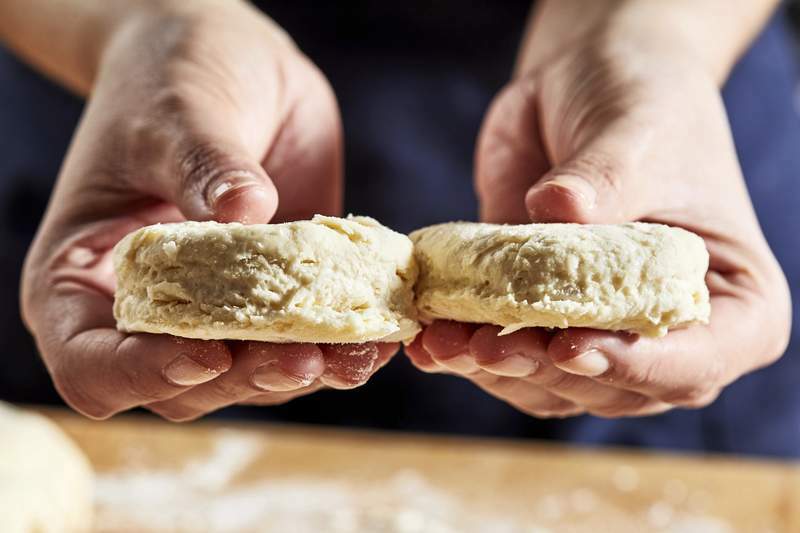 If the portions are misshapen, use your fingertips to gently reshape the dough into level cylinders. Bake (upper rack) for 10 to 12 minutes, until the tops are light golden brown, rotating the pan from front to back halfway through. Brush the hot biscuits with melted butter, if desired. Serve warm. Makes 10 to 11 servings. The biscuits can be stored in zip-top bag at room temperature for up to 24 hours. Reheat them in a 300-degree oven 10 minutes.